Browsing through this client's email for the brief, and quite surprised that she first contacted me on 27 Dec 2007 (wow, 2 years ago), stating that "...We need it either by june 08 or end of 08..."
I decided to do a Caricature in colour marker with background and body for my actual day wedding (14 Nov 2009) as my wedding photos doesnt turn out well. 3. Groom wearing black suit, bride hair with simple tiara & veil (preferably no perm hair)"
My impression of Singapore Polytechnic was not like this building. This was searched online. I’m Phoebe. 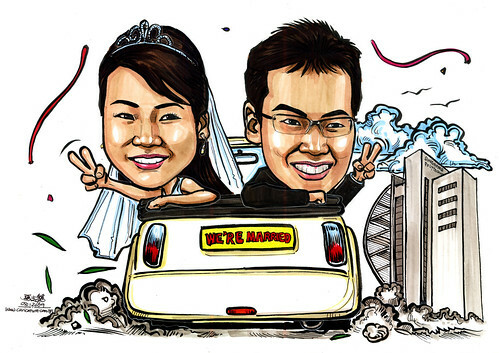 Thanks for your great drawing for my wedding (14 Nov 2009 – Drawing about the Singapore Poly)!! Loves it a lot.. my husband and friends and relatives had lots of great compliment on the drawing :) Thank you!! I will drop you another email regarding another drawing for my cousin wedding in Dec. Waiting for her email. "